Ahhh, email. Whether the first thing that comes to mind when you hear the word is your gmail account, your yahoo account, or the Pavlovian little icon to tell you “you’ve got mail,” the communication revolution that started in the 1990s may be more important today than it ever was. In fact, a whopping 80% of marketers agree that email is core to their business. Here’s why we think email marketing is so important. Think about the last retail store that you visited: did you get asked for your email address while at the checkout line? It can seem like the world is being taken over by social media channels – which is why email is a communication method to prioritize for your brand’s content marketing strategy, considering that email is 40 times more effective than Facebook and Twitter. This makes sense when you consider the fact that a personalized email message delivered to an inbox is much easier to focus on than a post buried in a distracting and busy newsfeed. At the end of the day, 72% of people prefer to receive promotional content through email compared to the 17% who prefer social media. Besides driving sales or inquiries, email marketing is a key way to direct traffic right to your website. In fact, reports have shown that 49% of marketers claim that email is directly linked to their business’ prime revenue source. The results will speak for themselves when you make email marketing a main component of your strategy. When it comes to results, the ROI of email marketing is impressive – did you know that email actually generates the highest ROI for marketers compared to all other channels? Email marketing yields an average of 4,300 percent return on investment for businesses in the United States, and even though there are an abundance of tools out there for marketers, email proves to be the best for overall business growth, and for the ability to take a peek into what interests your audience, as well as their overall behavior. There are 205 billion emails sent out every single day. So, how do you make yours stand out from the rest? The message should deliver strong visuals, relevant and engaging content, and, above all else, it needs to kick off with an appealing, click-worthy subject line. Newsletters tailored to your specific audience and the content that would be of value to them. Anything new and exciting brand news or product releases that your clients should know. Send coupons, discounts, or giveaways, so that your audience feels like they’ve got exclusive access to special perks.re being exclusively chosen. Since you are addressing them individually, email is a way to personally connect with your clients, while thoughtfully building brand loyalty. And although social posts might get lost in the sea of the interweb, an email is something tangible, delivered straight to your reader, that they can’t help but take notice of. 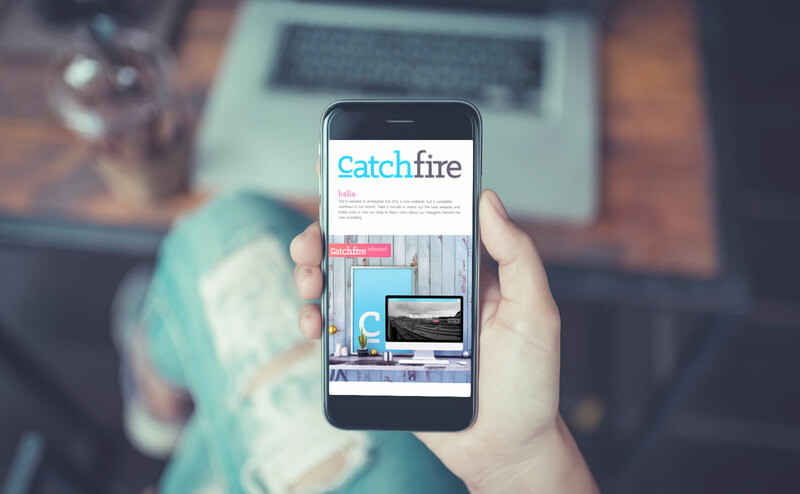 At Catchfire, we’re all about email marketing – both for our clients and for ourselves! We send out a monthly newsletter to all of our clients to make sure they get the most recent updates on all of the latest and greatest going on in the social media world. Curious about what kind of easter eggs we drop into our newsletter? Subscribe to find out!